Recently the islands of Vanuatu have been showing signs of increased volcanic activity. The New Zealand Metservice plays an important role in the monitoring of these volcanoes, as they are the Volcanic Ash Advisory Centre (VAAC Wellington) for the region, one of only 9 centres around the world as shown in the map below. If any of these volcanoes (or any others within the area of responsibility) were to emit a significant amount of ash during an eruption this would pose a threat to air traffic safety, and appropriate warnings would need to be issued to ensure the safety of aircraft and their occupants. 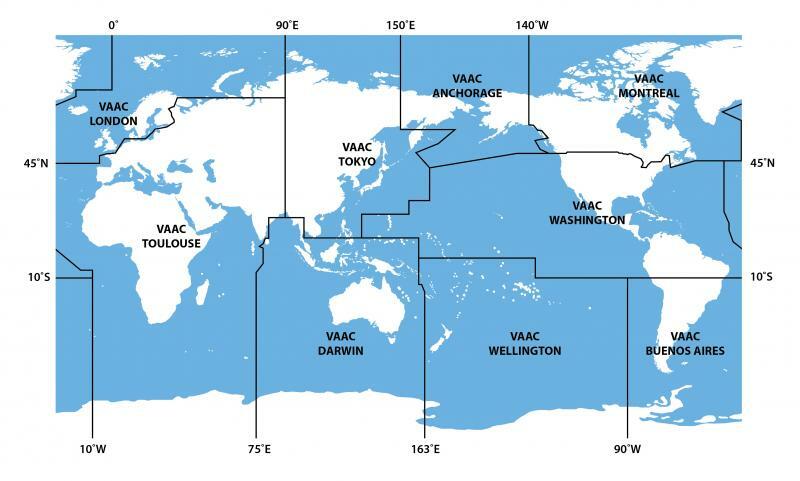 Above is a map of the designated VAAC areas around the world. The Wellington Volcanic Ash Advisory Centre (VAAC) is one of nine VAACs that operate under an international system called the International Airways Volcano Watch (IAVW), set up and co-ordinated by the International Civil Aviation Organization (ICAO). More detailed information about IAVW can be obtained from the relevant ICAO web page. The function of each of the nine centres under the IAVW is to respond to reports of volcanic ash within their region and provide forecasts to the aviation community of ash cloud extent and movement. Observations may come from ground stations and Volcano observatories, aircraft in flight or orbiting satellites. The ash warnings issued are in the form of Volcanic Ash Advisories and SIGMETs describing the current and future extent of ash. Volcanic ash constitutes a serious threat to aircraft operations primarily due to the effect of the corrosive gases and abrasive particles on aircraft engines and airframe. In addition to loss of engine performance or even flameout, ash effects may include instrument and radio failure, visibility problems and damage to other external flying components as well as contamination of the aircraft interior. Such potentially serious and expensive damage is best prevented by avoiding flying through ash altogether. Over recent years, improvements in observation networks, satellite technology, computer modelling and our increased understanding of the phenomena have led to improved volcanic ash forecasting methods. Current imagery from satellites and webcams show that there are plumes of steam and smoke coming from several of the volcanoes in Vanuatu. This can be seen particularly on imagery of the Benbow and Marum volcano on Ambrym Island, and also Lopevi, though the Aoba and Yasur volcanoes are also showing signs of unrest. While they might look alarming at first glance, on closer inspection the plumes are very white, indicating that they are mostly steam or smoke current. An ash plume would look notably darker, with a brownish colour tinge. Using different satellite imagery; one that uses infra-red wavelengths to differentiate between ash and steam or cloud, we can determine that ash is not present. MetService meteorologist are monitoring these images which come into the forecast room every ten minutes. With the help of pilots and local observers on the ground, as well as our satellite imagery, we can conclude that a Volcanic Ash Advisory (VAA) is not currently required. However, Metservice is working closely with the Vanuatu Geo-Hazards Department, as well as New Zealand’s own Geo-Hazards team at GNS, to monitor the situation in case it changes. You can find more information about the Vanuatu volcanoes, including their alert level and webcams, at http://www.vmgd.gov.vu/vmgd/index.php/geohazards/volcano. The Wellington VAAC is operated by MetService on behalf of the New Zealand Meteorological Authority (CAA NZ), and is located in Wellington, New Zealand. The Wellington Meteorological Watch Office (MWO) is co-located with the Wellington VAAC. The Wellington MWO issues SIGMETs for the two New Zealand FIRs, NZZC (New Zealand FIR) and NZZO (Auckland Oceanic FIR). A local enhancement of the Wellington VAAC, the New Zealand Volcanic Ash Advisory System (VAAS) is primarily provided for the New Zealand FIR through interactions of aircraft operators, Airways NZ, Meteorological Service of New Zealand limited (MetService), GNS Science Limited and the Civil Aviation Authority of New Zealand (CAA). More information on VAAS can be obtained from the CAA web page Volcanic Ash Advisory System. For more information about VAAC Wellington, and to see if there are any current Volcanic Ash Advisories, visit http://vaac.metservice.com/index.html.